Negativity is such a waste of time and energy. You can have a positive attitude and feel as if you are ready for anything and then step out of your front door. The negativity swells throughout the air with irate drivers, pedestrians, co-workers and friends. Before long, your sunshine has turned into doom and gloom. Prepare yourself for what the world has to throw at you with these amazing crystals that repel negativity. Here are best crystals to repel negativity. Black Tourmaline is a stone of protection. It will protect you from toxic energy caused from other people. In addition, it sets an energetic boundary between you and others to avoid a negative energy from entering your space. Carry a black tourmaline crystal in your pocket or wear as a piece of jewelry. Nothing or no one will be able to zap away your positive attitude. If you don’t have any black tourmaline, you can buy some here. Emotions from negative people can soon rub off and turmoil to a situation. Amethyst is known for its ability to calm impatience, stress and how you handle the annoying actions of others. Amethyst is also a great crystal for providing safety through travel and protection from thieves. You can find amethyst here. Smoky quartz is a very protective and grounding stone. It removes negativity and negative energy of any kind and transforms them to positive energy. It is often used for relieving depression and elevating moods. Smoky quartz relieves stress, fear, jealousy, anger and other negative emotions by transforming them into positive energies. If you need some smokey quartz, you find some here. It is impossible for citrine to hold negative energy. Rather, it dissipates and grounds energy that it comes into contact with. It never needs cleared or cleansed and is naturally protecting of the environment. It will generate productivity and creativeness while warding off negative spirits and energy. Use one or all of these crystal types in your meditation to feel protected, calm and ready for whatever the day has to offer. You can also place in corners of a room at home or work and feel blessed with good spirits. You can find citrine here. 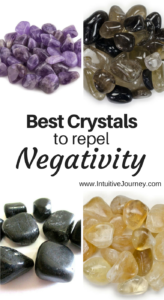 Like Best Crystals to Repel Negativity? I’d love for you to PIN IT! I carry Amethyist on a daily. Besides it’s also my earthstone. It does make me feel very secure.